Enjoying The Course: Why Turn the Tables on My Running Form? It's no secret that one of my goals for 2018 is to transition to forefoot running. I feel like it's all I've been talking about lately. It's definitely my current BHAG - Big Hairy Audacious Goal. I've had a few people ask me why I decided to make the change, so I thought it would be a good idea to share my why behind this life-changing goal. It all started a few years ago when I read Born to Run. Well, it may have started earlier than that, but that's when I really fell in love with the idea. I want to have lighter legs! Will transitioning help me achieve all these? I sure hope so! And the evidence seems to support it. I haven't done a ton of research yet. Like I mentioned earlier, I was pretty much sold on the idea after reading Born to Run. It just made sense! Fast forward a couple years to Blogfest this past summer. I took a seminar on the Myths of Barefoot Running and was again convinced that I should take this step. But I was in the middle of my birthday challenge to run 40 miles. And in the midst of my 600 mile goal for 2017. There was always an excuse. But not anymore. Find out why @EnjoytheCourse is turning the tables on her running form and making the switch to #forefootrunning! In the seminar, one of the things I learned was that you should take the transition really slowly and plan for a good year to transition without any injuries. And that's when my 2018 goal was born. I didn't have any other running or race goals in mind for 2018, so the timing was finally right. The research that I have done indicates so many long-term benefits! I'm really hopeful that the more research I do, the more practicing I do, the more I'll mentally be able to make this transition. If you're not familiar with forefoot running, basically it's striking with the ball (or forefoot) as opposed to hitting the pavement heel first. I plan to write monthly posts on the topic to not only share some of my research but also share updates on my transition. I hope you'll follow along on my journey! Are you a heel or forefoot striker? Have you ever tried to drastically change your running form? Have you read Chi Running? I think that may help with your transition. I don't really have a BHAG for this year. Most of my focus is on setting myself up for a 2019 BHAG but we'll see what's in the cards. No, I haven't read Chi Running. I'll have to look it up. Thanks for the suggestion! Can't wait to hear more about your 2019 BHAG! I'm really interested to follow you on this journey. 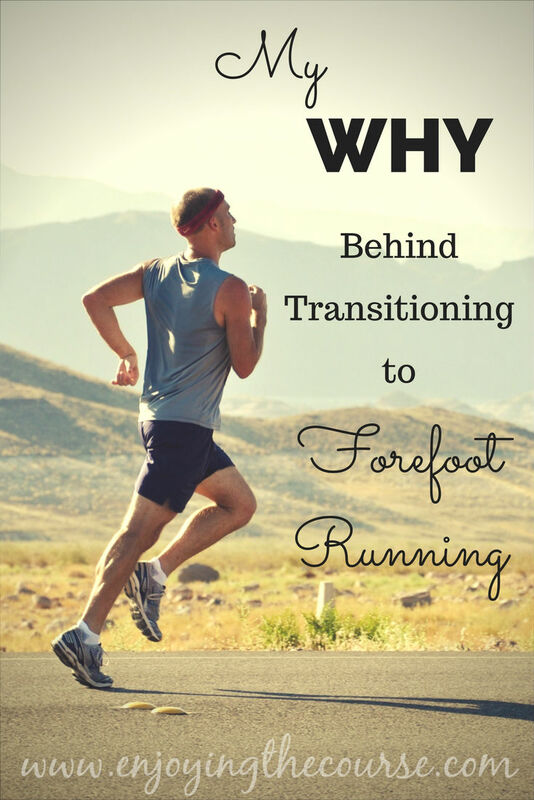 I won't be transitioning from heel striking to forefoot running but I'm all about those feet! We really don't give enough credit to our feet! They do so much for us and we just beat them up. :( I'm really looking forward to growing through this process. I never really thought too much about how I run. I have never had problems in the past and am not injury prone, so what I have been doing much be working. I read that book a few years ago as well and I did not care for it. Good luck! I'm curious why you didn't like the book. I think you've nailed it. WE don't have to change our running form, but if we're getting injured or not hitting our goals there are little tweaks that can make a big difference! Yes, exactly! I really want to love running for a long time, and I feel like taking a mindful journey to change my form will allow me to do that. One of the things I found that helped forefoot running is a faster cadence. If you're on the balls of your feet, it's easier to turnover and doesn't take as long. I do think I've heard that as well. Looking forward to increasing my speed with a faster cadence. Thanks, Lesley! I agree with Marcia - Chi Running is a great book! I'm kind of a mid-foot striker and I've gotten there from being a heel striker. I didn't really work to change my running form (I did a little but not as much as I could have) but I did find that it changed with the addition of CrossFit into my life. I got stronger and ended up with faster turnover plus the ability to pick up my legs a little higher. Thanks, Jennifer. I think I definitely need to find/read that book! I agree that strength training will help me immensely with the transition. In the IDEAWorld seminar I took, she also talked about using a metronome when running. I think there is a metronome option in my Garmin. I'll need to look into that a bit more. Thanks for the suggestion. OKAY I WANT TO KNOW EVERYTHING. I noticed some people running that way during my last races and I was so confused. Now, I just want to know more!! Hi Sarah! Forefoot, barefoot, minimalist running all kind of mean the same thing and is a pretty big trend in the running world right now. I'm enjoying researching it more and hope to share my findings here from time to time (hopefully at least once a month). I hope you'll follow along and learn something new! I don't think there is one "catch all" form that works for injury prevention, but there is definitely a difference between heel striking and "slamming" your foot. I know because I am definitely guilty of having an slamming foot LOL. The most important thing is to find what works for your body. Good luck! Totally agree! No such thing as a one-size fits all approach to running, but I'm definitely going to give this forefoot running a serious try. I really feel it will be the best thing for me. I'd love to see how you do this! It seems like a good thing to do, but ohhhh so daunting! Very daunting! I'll be taking it very slow to re-teach my body how to run.